Pastor Marc came to us in 1996. 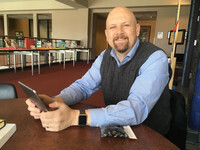 He has a Bachelor of Science in Education from Ohio University, a Master of Divinity from Ashland Theological Seminary, and a Doctor of Ministry from Trinity Evangelical Divinity School. He loves Jesus above everything else, the Bible, his wife, eating, reading, walking, being with people, listening to music on a high end pair of headphones, beautiful parks, and eating, The repetition of the word “eating” is not an accident. If you friend Pastor Marc on Facebook, he hosts a Facebook live devotional at 7 o’clock every morning.